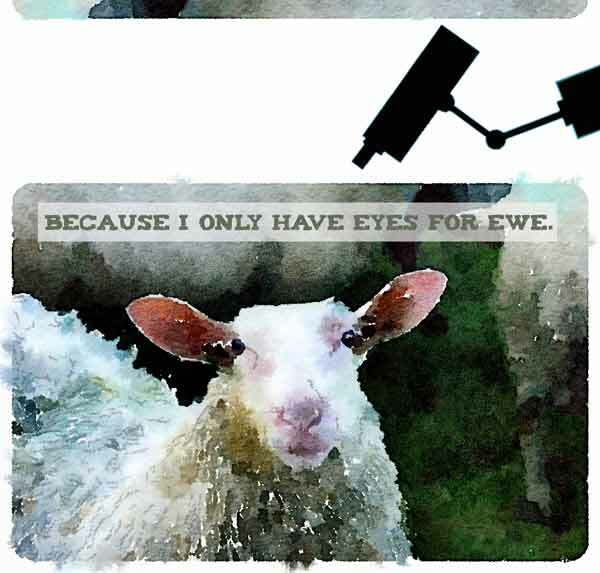 I remember taking the photo of the sheep. We were driving in the countryside and passed a field where all the sheep seemed interested in the people passing. We are crazy about sheep. There is something fascinating about them. I don’t say that from an a priori position. I say it after Tamara and I have spent hours and hours watching them over the years. So on this occasion we stopped and I took some photos and we said hello. A couple of weeks ago I uploaded a jpeg of the photo into iPhoto and then transferred it to my iPhone. Once there, I ran the photo through Waterlogue to produce the image you can see. As a variation, I added the text in Photoshop and we put it up as one of the images on our ecard site. Later, and this is where I get to the point of this article, I added the strip at the top of the frame and I added the security camera. I see now that the strip at the top could be the next frame in a film, but I wasn’t thinking of that at the time. I just wanted something to bind the security camera into the whole image. What was on my mind when I added the security camera? Have you see the film Elizabeth, the historical drama about the life of Queen Elizabeth I of England? The film, starring Kate Blanchett in the title role, appeared in cinemas in 1998 and it won rave reviews and awards. The film begins with Elizabeth as a young woman newly ascended to the throne following the death of her sister Mary I of England who had imprisoned her. It was a bloody time, with threats to Elizabeth and to England. The film is an illusion of course. Be that as it may, when I read reports of the latest leaks by Edward Snowden, the NSA contractor, I find myself picturing scenes from the film. I picture spies exchanging messages in dark corridors, countries plotting against one another, idealists revealed as double agents, and people being tortured to extract information. Then I wind forward to today and I picture a new device that can detect weapons at a distance. I picture a police car parked by the side of the road, scanning pedestrians with the device. Now I change the scenario. Now this amazing device can read the letters and notes that the pedestrians carry. It’s looking for communications about weapons. It scans all the letters and notes of all the pedestrians. And what does it see? You can fill in the blank with any of your intimate, private notes, letters, and moments. That scenario is not like Elizabethan times. This is an invasion everyone’s privacy; of putting everyone under the microscope, routinely and permanently. Of course, in some ways it is funny. On the one hand the courts are scrupulous about when someone has or has not an expectation of privacy. On the other hand, the State is routinely breaching everyone’s privacy. Need we worry? Need we care? For the moment let’s assume that those in power have the population’s best interests at heart. But what about the next Government, or the one after that? We are sliding into an acceptance of routine intrusion into our privacy. Once we accept these intrusions we will accept laws that back them up. We will accept laws that remove the right of oversight. We will accept laws that transfer power to the executive without redress in the courts. We will accept laws that establish closed courts without writ of habeas corpus. We will accept laws that remove trial by jury for certain serious crimes. Oh, silly me. We already have those laws in place. I think we do need to worry and care. Took the Jung test, that I found here in the sidebar. Got ISFJ. Glad you found the test. What is an ISFJ? INFJ – “Author”. Strong drive and enjoyment to help others. Complex personality. 1.5% of total population. I feel like I passed a test. Next PostDo You Have A Favourite Card Shop?